The environment your pet parrot lives in could quite literally mean the difference between a healthy bird with normal behavior and a sick bird with behavioral problems, and even in some instances life and death! Choosing your pet's cage is very important, as in the wild a bird would spend much of its day flying from tree to tree in search of food and at play. In captivity, one must allow for some sort of exercise, entertainment and self-expression as your bird can't leave its cage unless someone lets it out. It is very important to choose the correct cage for your pet to allow it to be happy while you are out of the house or at work, as it will be left in its cage for a large part of the day. That is why not just any old cage will do. Keep in mind the species of parrot you intend keeping, and what would be suitable for you and more important the bird. Consider how much space you can spare in your home (hopefully, if you have little space, you would not consider buying a large Macaw!). The first step in providing a comfortable environment for your bird is the cage itself. 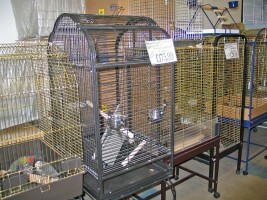 Buy the largest cage you can afford that is suitable for both your home and the bird. At minimum, in the design of any bird cage the diameter or shortest dimension of the floor should be at least twice the span of the fully extended both wings, and the minimum height at least one and half times the overall length from head to tip of tail of the largest bird to be kept in the cage. This is based on one bird per cage, if two birds are to be kept in the cage then these dimensions must be increased by a minimum of 50%. The cage bar spacing is critical. The species being kept in the cage should never be able to put their heads through the bars of their cage. The danger is that birds have been known to put their head through the bars, get stuck, and not be able to get back in. The cage bar thickness must also be taken into account as larger parrots have very powerful beaks and would in no time bend and possibly break thin bars. It is also better if the cage has some horizontal bars for the bird to climb up and down. While birds can navigate up and down vertical bars, it is more difficult. There are numerous designs to suite all tastes. Generally a rectangular metal cage, preferably longer than it is tall, is the best as it allows the bird to hop from perch to perch. Tall, narrow cages prove to be rather impractical, as most birds do NOT fly straight up and down. Round cages create a situation in which every perch across its width is in some way directly over the perch below it. This leads to continual soiling with faeces of all lower perches, as in this shape cage the bird is only able to perch in one position or climb the side of the cage, which can also lead to food and water containers being soiled with faeces. In the lower price range, there are cages made of wire. The wire may or may not be painted or powder-coated. 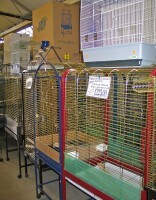 These cages come in sizes suitable up to a medium sized parrot such as a Pionus. If you choose a wire cage, be sure that the wire is not made of a metal that is toxic, and that if painted the paint does not contain lead. Many more expensive cages are made of iron or steel and are then sandblasted and powder-coated but as before, be sure the coating is not toxic and that any paint does not contain lead. These cages are durable, long lasting, and withstand busy beaks and escape artists. Ensure that all welds are smooth with no sharp edges. All doors should be escape-proof or easily made to lock with a clip or lock. Stainless-steel cages are the best as they are non-toxic, indestructible, easy to keep clean, but cost wise are very expensive but in the long run is by far better value for your money. When buying a cage, one of the most important things to think about is the expected life span of the bird compared to saving money on a cage. Careful consideration must also be given to the choice of perches used, as your Pet Parrot will spend most of its time while in his cage standing on one. The best perches are natural tree branches. Providing nontoxic, washed, fresh branches such as apple, elm, ash, maple or willow will be both functional and attractive in the cage. Natural branches should be selected such that a variety of diameters are available to perch on. This affords various textures, choice of grip and good exercise for the feet, they also provide entertainment value for those birds that like to chew. Wood is more difficult to disinfect due to its porous nature - perches must therefore be washed and replaced often. I have seen cages with sandpaper-covered perches (not recommended). This type of perch will do little to wear the nails down and can lead to serious foot irritation, sores or deep infections. Plastic perches are commonly used although not recommended, they are easy to clean and disinfect but may prove slippery for gripping and seem to only be available in a couple of sizes. Larger Parrots may chew and splinter the plastics into sharp pieces. Water and food dishes are best made from stainless steel that are easy to clean and disinfect every day and should be attached securely to the side of the cage. The dishes should not be too deep or food will be wasted. Position the dishes such that they are easily accessible and will not be accidentally soiled with faeces. They should never be on the bottom of the cage since this is the bird's "toilet". Many pet parrots enjoy a good bath so once in a while a large shallow dish of water can be provided. Some birds like to be misted with a fine tepid water spray. Try this a few times and see how your bird reacts. Whether you are home with your bird or not, a pet must have some form of entertainment as being cooped up in a cage all day can be a very frustrating and boring experience. They love to explore and play with toys, which may include rope, stainless steel mirrors, bells, hanging toys and pieces of wood to chew. There are no quality controls or regulations to provide safe toys. Therefore great care must be taken to ensure the toys purchased are free from potential dangers. The following could be dangerous: clasps, bell clappers, open chain links, removable parts, easily broken parts, natural hemp or cotton rope seems to provide a variety of texture but must be monitored carefully so that the fine fibers do not become entangled around the bird's toes. This is a much more serious problem with synthetic fiber rope. These should never be used. Rubber toys can be very dangerous as they are easily chewed apart and must be avoided. Make sure toys are large enough not to be swallowed. It pays to experiment with toys etc, and find out what your bird enjoys the most. Some birds like to hide in boxes or paper bags. You may even like to have an assortment of toys that can be rotated every week to keep the bird from getting bored. All toys should be periodically washed and disinfected. It is essential to rinse them well after washing with clean water. The cage needs to be located where the bird gets lots of interaction with you and the family. It is not advisable to locate the cage in a room where the sudden appearance of anyone coming and going into the room will startle or frighten the bird. The cage should be against a wall to give the feeling of security, other birds need added security and prefer to be in a corner or to have their cage partially covered. Situate the cage where it receives some natural light to keep your bird healthy. Avoid it being exposed in a window, as excessive sunshine or people moving about outside may cause distress, especially if your bird is in view of any type of predator (like cats). Never locate it near or in a kitchen as several kitchen processes give of fumes that will be toxic to your bird. Other potential hazards are draughty places and excessive temperature fluctuations. Normal house temperatures of 21-27° C (70-80° F) are tolerated well by pet birds. Many parrots need some extra humidity in the air. Humidifiers work well if you are diligent about disinfecting them. Many species of parrots create a "dust" that can cause them and even humans, breathing problems. An air purifier is a must in any home keeping pet parrots. Parrots should NEVER be exposed to cigarette or cigar smoke, burning candles, incense etc. The cage and its contents must be kept in pristine condition at all times as this will greatly assist in keeping a happy, lively, healthy and long lived pet parrot.